(Bloomberg Opinion) -- J. Crew Group might be one step closer to dismantling the Mickey Drexler era. 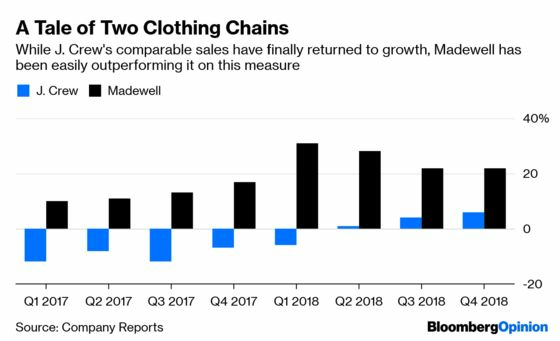 The retailer, which has struggled under a heavy debt load and fierce fashion competition, announced Thursday that is exploring strategic alternatives including an IPO of its flourishing Madewell business. That younger chain was very much Drexler’s baby during his run as CEO of J. Crew, a job he held from 2003 to 2017. It was a cornerstone of his bid to dominate the American mall. Cleaving the J. Crew empire would be an echo of a recent move by one of its close competitors. Gap Inc. said in February that it is to split into two public companies, one comprised only of its Old Navy brand, and another comprised of the rest of the Gap portfolio. At Gap, I thought the split made sense: The fast-growing Old Navy brand is a on a different trajectory from the mature Gap and Banana Republic, and that calls for different business priorities. Plus, Gap and Banana, I reasoned, might have a better shot of healing if executives could focus more acutely on their problems. That same logic applies at J. Crew. The namesake brand has been in a sustained rough patch, and Madewell continues to soar. Disentangling them might do them each good. And Levi Strauss & Co. shares up some 35 percent from the company’s March IPO, the board has reason to hope that its jeans-centric Madewell brand could enjoy a similarly sunny stock-market debut. But just as I said then that Gap leaders failed by letting these businesses end up on such different tracks, I think the same is true at J. Crew. It wasn’t that long ago that the brand was enjoying something of an imperial era, with Michelle Obama sporting its cardigans, and its bubble necklaces and daytime sequins showing up seemingly everywhere. But it lost its way on so many different aspects of the business – on garment fit, pricing and merchandising – and that is what put it so far out of step with galloping Madewell. The Madewell news wasn’t the only shakeup the company announced Thursday. It also said Michael Nicholson, its president and chief operating officer, has been named interim CEO. The company has been without a permanent chief executive since November, when Jim Brett stepped down from the post abruptly after only 16 months in the job. At the time, an “office of the CEO” was named to keep the ship running. But essentially, they are replacing one temporary solution with another. Perhaps this means Nicholson is in an audition of sorts for the permanent job, but it doesn’t seem like a good sign to me that they haven’t announced a longer-term solution nearly five months after Brett left. It’s not helpful, either, that the company said Thursday that chief experience officer Adam Brotman is departing, leaving one more c-suite question mark. Given its plans to explore an IPO of its most thriving business, whomever they find to take the permanent leadership reins at what’s left behind must have an appetite for risk and dramatic change.